That's just .04 cents per hour! That means the energy required to provide the comfort you deserve is more affordable than ever . Imagine never having to worry about high power bills again; just dial in a comfortable setting and walk away. In fact, with SEER ratings of up to 26.0, the Mitsubishi Mr. Slim ductless air conditioner is one the most efficient and cost-effective systems you can buy . Mitsubishi engineers designed these systems to provide peace of mind from both a comfort and energy standpoint. Mitsubishi Electric ductless cooling and heating systems are dramatically more efficient than traditional central systems. Utilizing compressors that automatically adjust to the changing environment of the space they are installed in allows the system to use only the energy that is needed. *Operating cost estimates based on a nationwide average of .12 cents per KW of energy usage, using a 9000 BTU, 26 SEER model. Your actual costs may vary. Here's how to determine the hourly energy usage cost of your selected system. Locate your utility bill and look for the “Kw/hr cost. This will be expressed as cents per hour of kilowatt hour consumption. Locate this cost per Kw/hr on your bill. 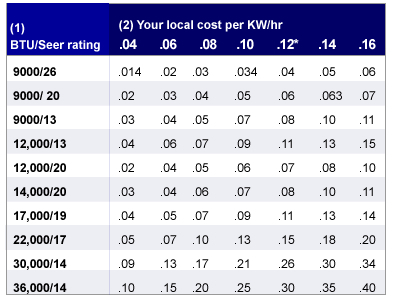 Use the chart below to determine your hourly cost based on the selected capacity and your local energy costs (Cents per Kw hour. The graph above is comparing the various hourly operating costs in cents. To the left is the Btu rating (1) with an assigned seer rating next to it. Across the top (2) are the various local costs per hour of your electricity. The 9,000/26 model is 9,000 Btu's with a SEER rating of 26. To the right are the different hourly operating costs for that model. The cost per hour of .014 means that 9000 Btu 26 SEER system costs 1.4 cents per hour to operate. If you see .04 that means 4 cents per hour. Translated to English, this means that if the hourly cost of operation of a 12,000 Btu system is .07, or 7 cents per hour and you ran it 10 hours a day for 30 days, your total utility cost for the entire month would be just $21.00. Compare that to an average 12 year old, 8 SEER, 3 ton central system that consumes 55 cents per hour and the same 10 hours a day for 30 days would cost $165.00 for the month. That's 785% (almost 8 times) more to operate the inefficient 3 ton system. Granted, the capacity of the 3 ton is about 3 times of our example system but you can see where energy savings lay – In the Seer rating. Three of our 12,000 Btu systems would equal the capacity of the older 3 ton central system and would cost just $63.00 a month to operate, using 62% less energy.